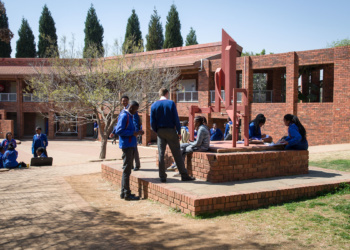 Pro Arte Alphen Park is a unique school located in the East of Pretoria, which successfully combines the arts and business. This High School offers six specialised focus areas, namely Dance, Art & Design, Music, Drama, Hospitality and Enterprise Management. 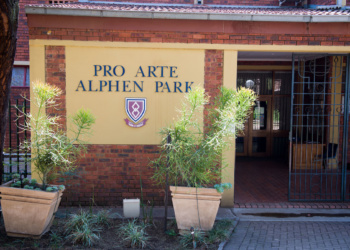 Pro Arte Alphen Park opened its doors in January 1994 with the amalgamation of two schools, namely Pro Arte, school for the arts (1969) and the Alphen Park Commercial High School. 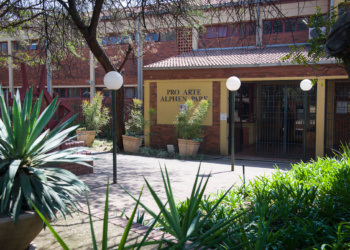 Pro Arte Alphen Park is an English medium school which is one of only a few focus schools established in Gauteng. 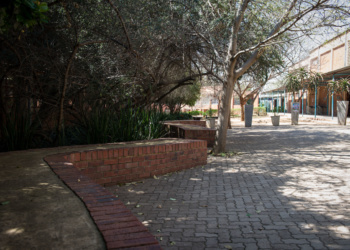 The school is situated in Pretoria East, Alphen Park, close to the Menlyn shopping centre. 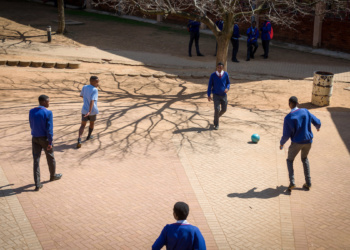 The school does not only serve learners from surrounding suburbs but also learners from all over the country. 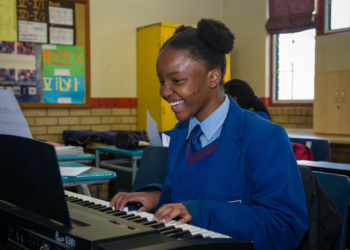 After school hours, tuition in Dance, Art, Music and Drama is offered to school going learners from any outside school by the Pro Arte afternoon Arts Academy. equipping learners with life skills to ensure that they become responsible adults. teaching in an understandable and relevant manner. rendering a service in accordance with contemporary needs. 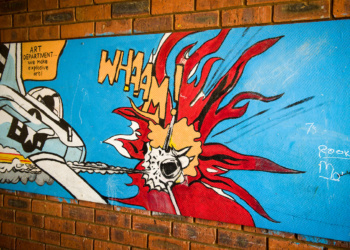 At Pro Arte Alphen Park we nurture creativity as a tool to resolve challenges. The school boasts a highly qualified staff component which contributes to our achievements. 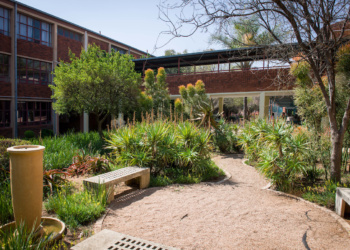 Our school governing body is eager to assist us in our endeavour to remain the preferred school for children interested in the arts in Pretoria. As a school, we also embrace the principles of democracy through respect for each other. Values such as respect, integrity, commitment and loyalty are treasured in our school. Our code of conduct is guided by these values. 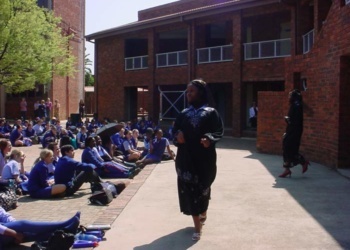 The management of the school regularly assesses the commitment of learners and teachers towards promoting these values. The school motto also reflects on these values: “Vigor et Veritas” which translated, means Strength and Integrity. Our school song embraces the principles of democracy by using Afrikaans, English and Sesotho. 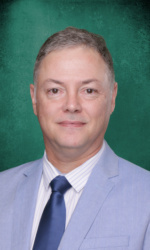 The music was composed by Prof. S Grové, who was a parent of the school. Purity, uniqueness, many-faceted and aesthetic values which reflect the beauty of the arts. The interlinking of focus areas, cultural inter-linking, academic subjects and also of arts and technology. A link in a chain which reflects our strength and unity. The head of the top diamond symbolizes striving for excellence, pointing towards a higher goal. The base of the bottom diamond symbolizes being anchored in a solid foundation and values. The border emphasizes unity and the colours silver and light blue reflect the standard of excellence we strive for. 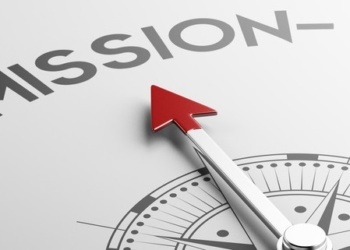 To be a key provider of education and training in the arts, entrepreneurship and academics. 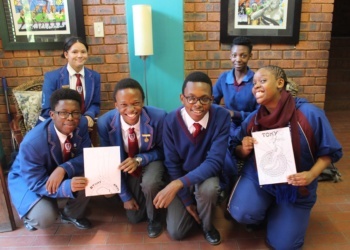 To utilise opportunities in the arts, entrepreneurship and academics to the full, within the multidimensional, creative, innovative and dynamic school community. A high school for the arts. Where minds are inspired to open. 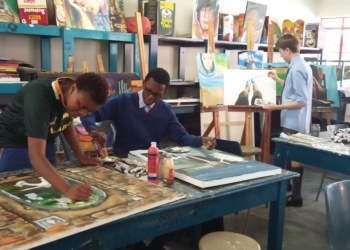 Since its inception, Pro Arte Alphen Park has achieved a 100% Grade 12 pass rate for seventeen years. Several accolades have been presented to the school for its achievements. We are also the custodian of the Simfonia Juventi Orchestra which consists of learners from all over Limpopo, Mpumalanga, Gauteng and North-West Province. They work and stay at the school during the April holidays. Our Hospitality department started the Chefs competition in district D4 six years ago. It has since grown into a much bigger competition in which other districts also participate. 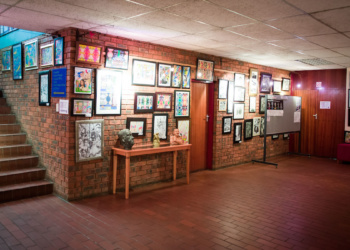 Pro Arte Alphen Park is one of only two founder members of the Tshwane Youth Arts Festival which has been presented in the State Theatre since 1996. 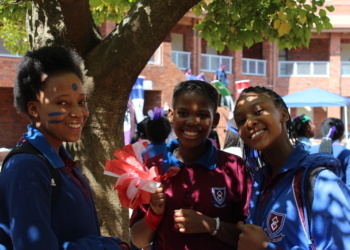 Each year approximately 10,000 learners from different schools participate in the festival over a period of three weeks. The school’s facilities have been built to accommodate each of the different focus areas to cater for a very unique learning experience. 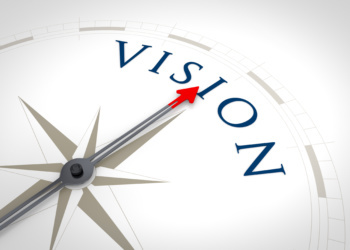 The needs of each of the focus areas are attended to in great detail. For Dance: There are three dance studios with wall to wall mirrors and bars for the dancers. For Drama: The department has their own performing theatre hall where shows are held as well as well equipped movement rooms with mirrors. For Hospitality: This focus area has very well equipped kitchens (one hot and one cold) to enable learners to perfect their culinary skills. 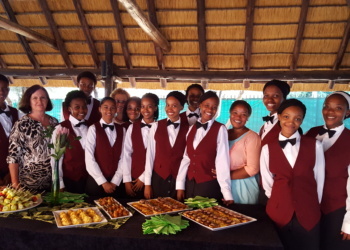 We also have a restaurant on the property where learners are enabled to practice the art of cheffing, plating, serving, hosting and hospitality. 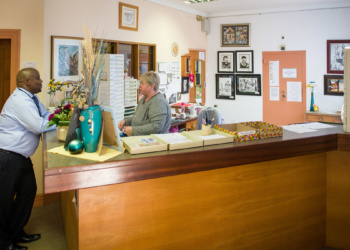 For Visual Arts: The Art focus area has well equipped studios for printing and design. 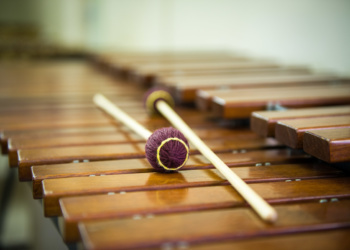 For Music: The Music focus area has 30 studios where individual lessons can be conducted. A variety of orchestra instruments are at the disposal of learners. 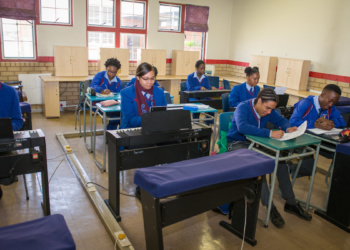 For Enterprise Management: We have three computer laboratories for this focus area ensuring learners have everything they need to succeed in their field. 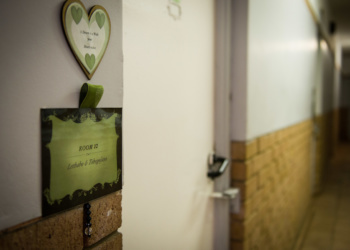 Our media centre is well resourced with books, visual and sound equipment to enable learners and teachers to create a stimulating learning environment. Learners also have access to computers and the internet to do research. 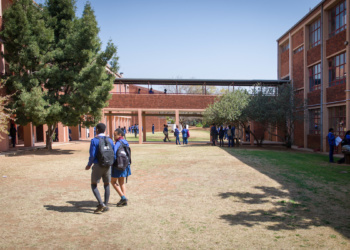 Class sizes: The school treasures the fact that our class sizes are kept small in order for teachers to be able to reach out to learners where individual needs arise. Learners also flourish in such a conducive educational environment. The appointment of additional teachers by the governing body contributes towards the smaller numbers in the classes. We currently have about 750 learners in the school. Our learners are diverse in respect of race, creed and talents. 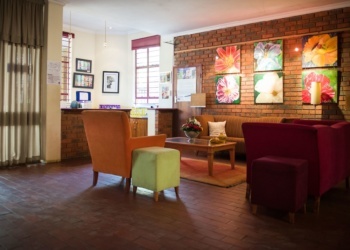 A large number of learners are accommodated in the hostel. 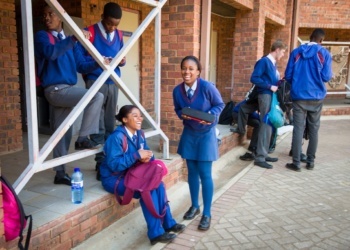 The hostel learners are representative of all the provinces in South Africa. 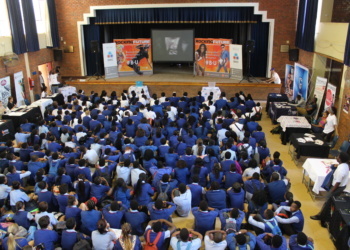 Currently it houses learners from the Limpopo, Mpumalanga, North West Province. The remaining learners reside in Gauteng; we have no specific feeder zone. Learners who apply to attend our school have a passion for either the arts, business related subjects or hospitality. The learners at our school are representative of the whole population regarding race and economical welfare. School rules are vital to help maintain order in a large group of people. School rules also lay the groundwork for adult responsibilities. There may be anywhere from a few hundred to a few thousand students at any level of education, ranging from high school to university. In order for staff to manage such large groups of learners, implementing rules for the students is necessary. Some rules are intended to protect the students as well as the teachers. Other rules exist to foster a healthy learning and teaching environment. Rules also help prepare students for life as an adult. By learning to follow rules as a child, a person may be better prepared for following laws as an adult. It also helps the student get used to adhering to policies and procedures that they will face as an employee once they reach adulthood. Click on our link below to download a copy of our rules. 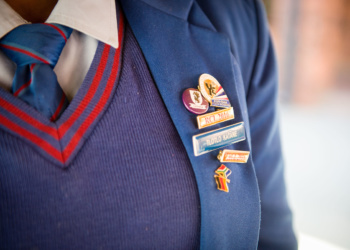 Learners will be required to start wearing winter uniform from 6 May 2019. All winter uniforms are now in stock at school uniform suppliers. Clothes must be neat and clean and should be worn according to season. School uniform rules must at all times be adhered to. Only grade 12’s may wear white shirts and agreed upon pull-over (white). 11 monthly payments from 1 Feb 2019 to 1 Dec 2019 : R2,690.00 per month. Once off settlement on or before 28 Feb 2019 : receive a 11.301% discount. PLEASE PAY YOUR SCHOOL FEES! YOU OWE IT TO YOUR CHILD! Pro Arte Villa Nova is a private hostel, self-sufficient in all aspects. We do not receive funds from the GDE or any other sectors. Hostel fees must be paid not later than the 3rd of each month. No exceptions will be made in 2017. Should your payments be late, your child will have to leave. STRICTLY 30 DAY PERIOD. ABSA: 1500 000 348, BRANCH: 335345, CURRENT ACCOUNT. PLEASE USE YOUR HOSTEL REFERENCE OR YOUR CHILDS NAME AND SURNAME WHEN MAKING PAYMENT. 14:00 & 18:00 and return between 15:00 & 18:00 on Sundays. a) No hostel children will be allowed to sleep over at a friend during the week. b) We are not allowed to give children medicine. Please see to it that they have the necessary medicine, should they require any. First day of hostel learners Gr9-Gr12 starts 10th Jan 2018. Gate opens at 14:00 and locks at 18:00: Prefects must be at hostel for a compulsory unity/orientation camp preparation starting Friday 6 Jan 2018 12:00. Gr8 learners must attend camp, please be at hostel Saturday 7 Jan 2018 12:00. All parents who wants to see Head of Hostel please phone to make appointment. Out- weekend – Please bring your own supper with as the kitchen will be closed. In 2018 all parents/guardians will receive updates on a monthly basis regarding child’s progress. Learners study and train in Classical Ballet, which is academically and technically demanding, plus Jazz and Spanish Dance. 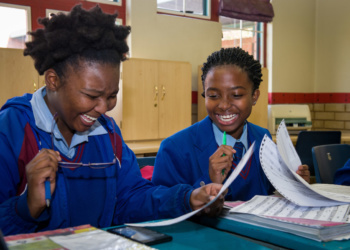 Compulsory academic components attached to Dance Studies are: Music and History of Ballet (Grade 8 and 9); Anatomy and Health Care; Music and History of Dance (Grade 10 and 11). Career opportunities: professional dancer, choreographer, set design, costume design, dance critic, physiotherapist and dance teacher. Creativity and talent are developed in a diverse, cultural environment. Learners develop their own style by analysing, questioning and conceptualising their ideas. Subjects: Visual Art and Design. Career opportunities: fine arts, architecture, jewellery design, interior design, theatre studies, fashion, photography. Tuition is offered in all symphonic instruments, as well as Piano, Organ, Harpsichord, Recorder, Voice, Classical Guitar and Drums. Subjects: Music, including practical tuition in one or two instruments, Sight-reading, Theory, Harmony (Music Literacy), Critical Reflection, Form, Music Technology, Composition, Aural Training and Improvisation. Career opportunities: teacher, performer (solo or in an orchestra), accompanist, ensemble player, programme compiler, arranger, composer, sound engineer and musical theatre. Learners receive background knowledge and practical experience. On completion, a learner will be a well-equipped drama specialist. 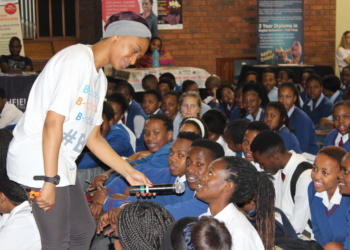 Learners develop self-confidence and communication skills as well. Subjects: Speech and Drama, and Practical Drama. Career opportunities: performing arts, theatre or film technical fields, or any people-orientated career. 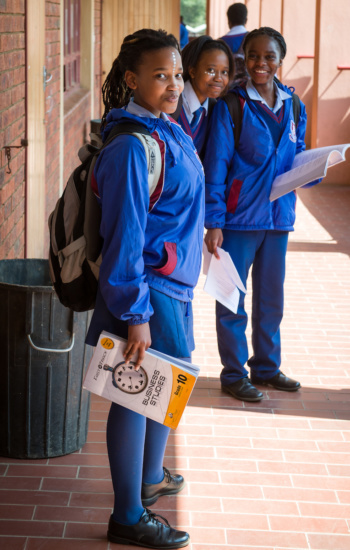 The section equips learners to enter the labour market on completion of their school career. 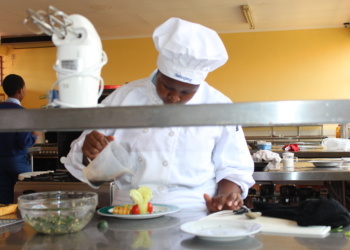 Learners are trained in all aspects related to running a restaurant efficiently at the fully equipped restaurant on site. Subjects: Hospitality Studies. Career opportunities: management, chefs and waiters in the hospitality industry (for example in hotels, restaurants, and industrial kitchens), entrepreneurial opportunities by establishing a small business, training, sales representatives for suppliers of the industry, and function co-ordinators. Learners develop entrepreneurial skills, and they even establish their own businesses aimed at making a substantial profit. Numeric skills are a prerequisite. Subjects: Accounting is compulsory. Career opportunities: entrepreneur, informatics, auditor, accountant or investment manager.